Physical attributes. The connector panel is on the rear of the WU336. Air intake is from the left side, and hot air is exhausted from the right front side of the chassis. The power connector is at the lower left of the connector panel, and a keypad is located at the back left of the cover panel. ECO mode.The WU336 has four Eco modes including one (Dynamic) that changes lamp power depending on scene content. The most significant ECO mode reduced brightness by 40%. It extends lamp life significantly, so using the Eco setting is advised if it produces sufficient light for the room and screen size. Zoom Lens Light Loss. The projector loses 13% of its potential light output at the telephoto end of its 1.3x zoom range compared to the wide angle end. 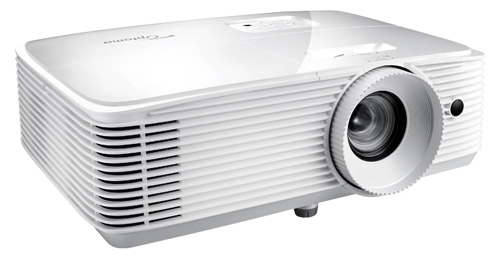 Brightness Uniformity.The brightness uniformity of the WU336 measured 63%, which is typical of very low priced projectors. The lower half of the image is the brightest and it gradually reduces in brightness toward the upper corners. There were no visible hot spots or vignetting, and the brightness variation is only visible in data projections with a lot of white space. Image Sharpness. The zoom lens focuses sharply from edge to edge throughout its range. Input Lag. The WU336 has an input lag of 33ms in all modes. Fan Noise. Fan noise is very low for a projector of this brightness. The noise is composed of low-to-medium frequencies that do not interfere with normal audio volume levels. Eco mode did reduce fan noise somewhat, but the decrease was hardly noticeable. Throw distance. The WU336 specs list an image size range of 27" to 300". It will throw a 150" 16:10 image from a distance of 16.75' to almost 22'. To check throw distance for your preferred screen size and aspect ratio, see the Optoma WU366 Projection Calculator. Vertical Offset. The WU336 throws the image upward such that the bottom edge of the projected image is 10% of the image height above the centerline of the lens. So for a 120" diagonal 16:10 picture that is 63" in height, the bottom edge is 6.3 inches above the lens centerline.